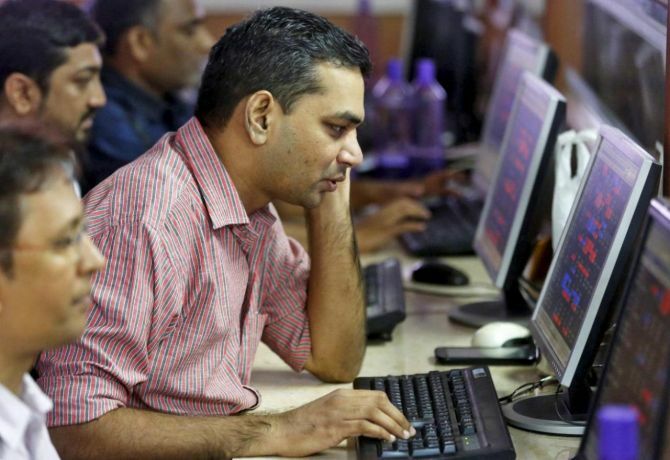 Benchmark indices Sensex and Nifty fell for the second consecutive session on Thursday as investors fretted over plunging rupee and rising crude oil prices, while August futures and options (F&O) expiry further added to market volatility. The BSE benchmark Sensex slipped 33 points, or 0.08 per cent, to 38,690. It shuttled between 38,819.06 and 38,581.83. The NSE Nifty declined 15 points, or 0.13 per cent, to 11,677. Intra-day, the 50-share index moved between 11,698.80 and 11,639.70. The Indian rupee plunged to a new life-time low of 70.85 against the dollar (intra-day) on Thursday. However, investors will be keenly awaiting the June-quarter GDP data to be announced on Friday, which will be one of the factors to decide the market course. "Profit booking extended today as weaker rupee, rise in oil prices and F&O expiry put pressure on domestic markets. “Rupee hit fresh low of 70.8 as US dollar was gaining strength against emerging market currencies. “Weak global markets also added pain to domestic market sentiments. “Q1 GDP is the key data to be watchful tomorrow, consensus expects GDP to grow by 7.6 per cent which may bring some respite to markets," Vinod Nair, Head of Research, Geojit Financial Services Ltd, said. Meanwhile, foreign portfolio investors (FPIs) sold shares worth Rs 1,415.87 crore on a net basis, while domestic institutional investors (DIIs) bought equities to the tune of Rs 1,114.36 crore on Wednesday, provisional data showed. Brent crude was trading 0.36 per cent higher at $77.74 a barrel while WTI oil was up 0.30 per cent at $69.72 in Asian trade. In Asian trade, stocks gave up earlier gains and fell as concerns persist over the development of the Sino-US trade spat. Shanghai Composite Index fell 1.14 per cent and Hong Kong's Hang Seng shed 1.01 per cent, while Japan's Nikkei ending 0.09 per cent higher. European shares too were trading weak in late morning deals as investors continued to monitor global trade talks and corporate earnings. Key indices such as Frankfurt's DAX fell 1 per cent and Paris CAC declined 0.44 per cent. London's FTSE was also quoting 0.58 per cent lower.